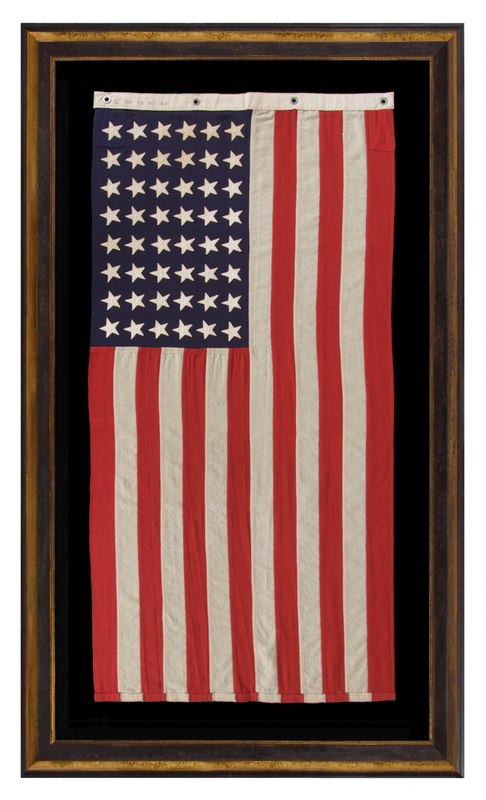 Flag Size (H x L): 68.5" x 31.25"
48 star American national flag, made during World War II (U.S. involvement 1941-45) and signed along the reverse side of the hoist with a black stencils that read: "U.S. No. 10 MI [Mare Island] 44.” Located on the western edge of the City of Vallejo, about 23 miles northeast of San Francisco, Mare Island (actually a peninsula) served as a principal seat of U.S. Navy defense, beginning in the mid-19th century. The site was originally chosen following an expedition that set forth in 1850, when Commodore John Drake Sloat was ordered to lead a survey party in quest of a logical site for the nation's first Pacific naval installation. Sloat recommended the island across the Napa River from the settlement of Vallejo; it being "free from ocean gales and from floods and freshets." On November 6th of that year, two months after California was admitted to statehood, President Fillmore reserved Mare Island for government use. The U.S. Navy Department acted favorably on Commodore Sloat's recommendations and Mare Island was purchased in July, 1852, for the sum of $83,410 for use as a naval shipyard. Two years later, on September 16th of 1854, Mare Island became the first permanent U.S. naval installation on the West Coast, with Commodore David G. Farragut serving as Mare Island's first base commander. The base became home to what was known as the Pacific Fleet, and remained so until the threat of Japanese expansionism caused the shift to a more advanced position at Pearl Harbor. It was very active in WWII, Korea, and Vietnam, but would eventually close in 1993 after Congress approved the findings of the Base Realignment and Closure Report. 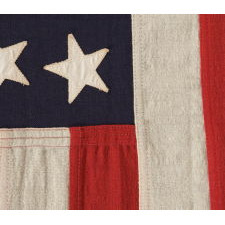 The canton and stripes of the flag are made of wool bunting that has been pieced and sewn with machine stitching. 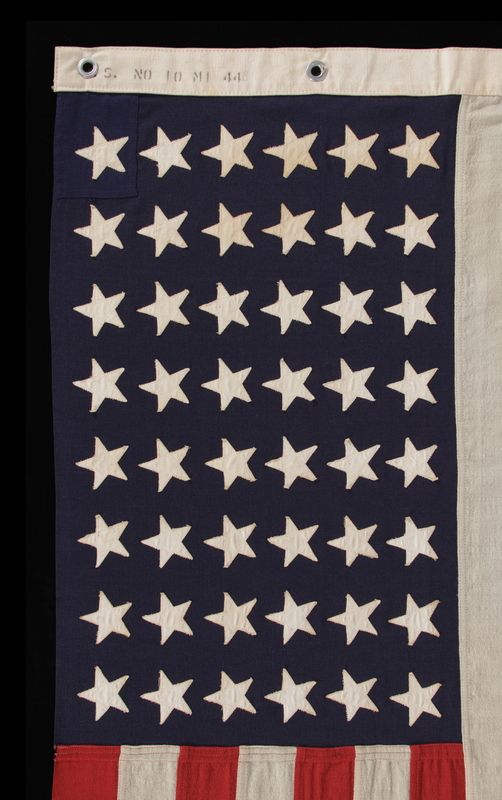 The stars are made of cotton and are double-appliquéd with a zigzag machine stitch. There is a heavy canvas binding along the hoist with 4 white metal grommets. 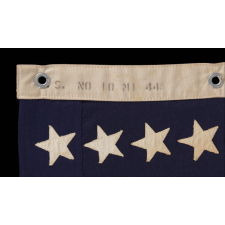 The weight of the wool and the stalwart construction is typical of what the Navy preferred for its flags in this period. The rectangular patches at the top and bottom corners of the hoist end are original to the flag's construction. These are called gussets and were added for support at the points where the flag received the most stress when it was flown. 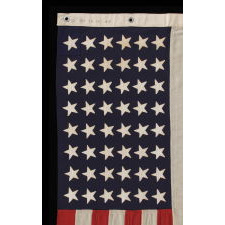 The fabric is heavier grade than what was usually employed in commercially-made flags and the fly end is bound with 4 rows of stitching instead of the usual two encountered in standard, commercially-made flags. “No. 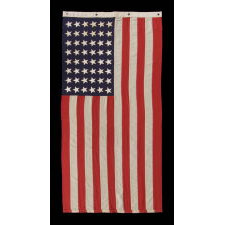 10” is a size designation for U.S. Navy small boat ensigns, specifying a flag that was to be 2.9 x 5.51 feet. Measuring approx. 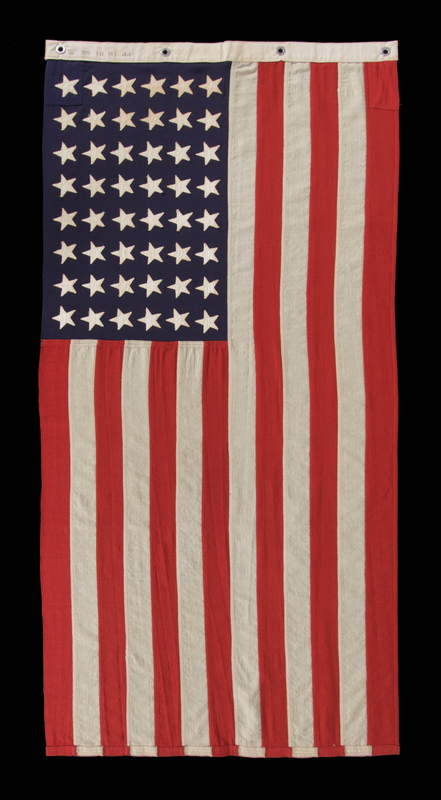 38" on the hoist and 61.5" on the fly, this was the second to the smallest variety of Stars & Stripes in use by the Navy in 1944. 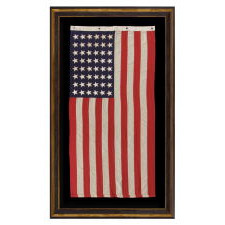 This small scale is especially nice for collectors, because it is more easily framed and displayed than many pieced-and-sewn flags of this era. 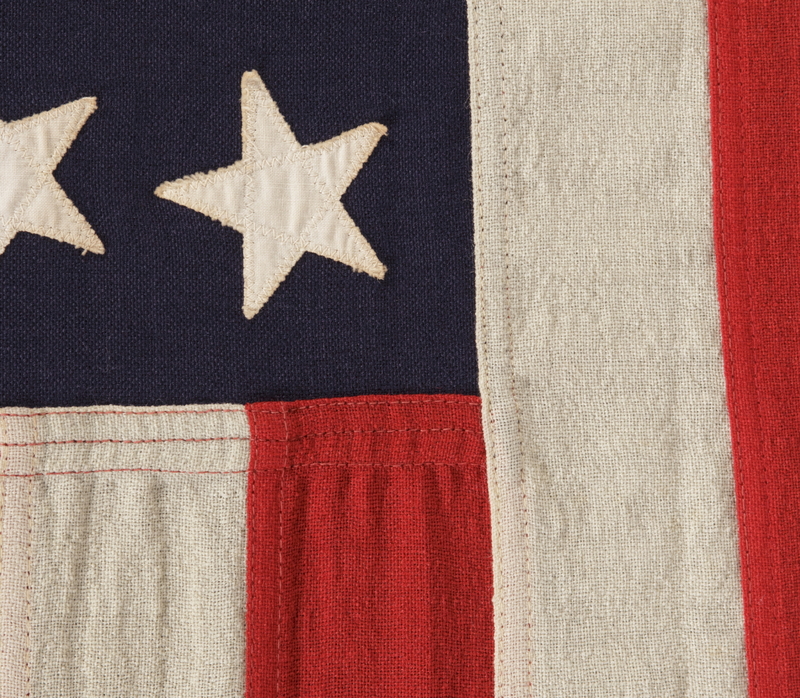 The 48 star flag became official in 1912 following the addition of New Mexico and Arizona. 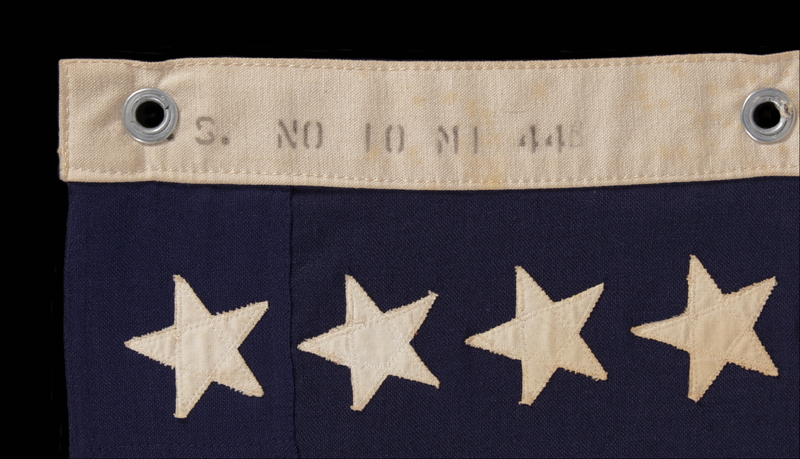 48 remained the official star count throughout WWI (U.S. involvement 1917-18), WWII, and the Korean War (1950-53), until Alaska gained statehood in 1959 and the 49th star was added. The black-painted, hand-gilded molding, and distressed molding is Italian. The glazing is U.V. protective plexiglass. Feel free to contact us for more details. Condition: Excellent; remarkable for a wool flag of this period.